The crested caracara is known by many names, including the caracara eagle, king buzzard, Mexican buzzard, or the Mexican eagle. Its image is actually a national symbol of Mexico. 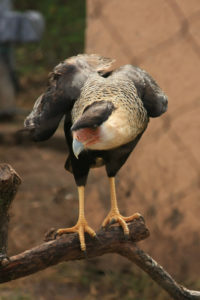 The crested caracara is found throughout most of South American and up into the southernmost reaches of the United States, including Texas and Florida. Although crested caracaras usually eat carrion, they will take advantage of any food opportunity by eating small mammals, amphibians, eggs, small reptiles, worms, and insects. Conservation status: Most populations of these birds are considered stable, with the exception of the small Florida population that is considered threatened. Caracaras are part of the falcon family. They are different from other falcon species in that they will build a large stick nest for their eggs, and other falcons do not build nests. Caracaras are also the most terrestrial of the falcon family, spending much of their time on the ground hunting food.